Calvary was grateful to be joined by a group of volunteers from Mark G. Anderson Consultants last week who led a special series of Employment Prep classes for Calvary’s Life Skills educational program. 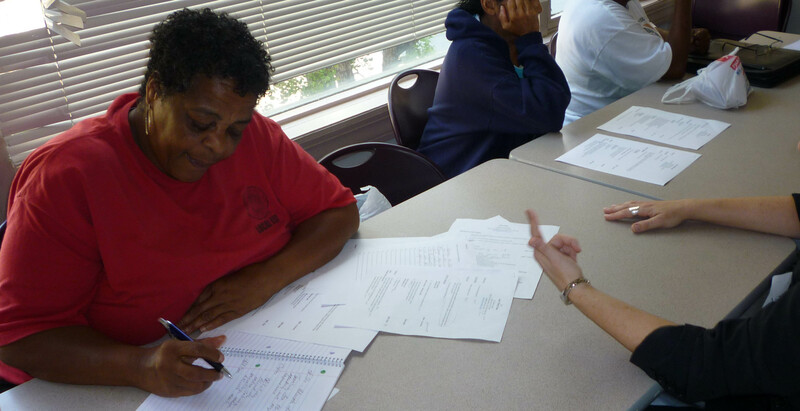 This two-day session gave the women at Calvary Women’s Shelter a chance at receiving some in-depth guidance on resume and interviewing essentials. Women at Calvary are employed at twice the rate of all people who are homeless in DC. But many of the women in our programs are also continuing their education or actively seeking a job. For these women, this session provided a unique opportunity to receive resume critiques and tips for a successful interview to get them the job. The first day consisted of a round of mock interviews and a crash course in “dos and don’ts” complete with a demonstration of what an appropriate – and inappropriate – interview outfit looks like. For the next session, the women were assigned the task of critiquing and editing a mistake-ridden sample resume. One-on-one resume critiques and more practice interviews continued into the second day’s class. The volunteers wrapped up the class by talking about benefits and with a motivational story about networking, because “you never know what opportunities can come” of the relationships you make with people. The career interests of the women in the room varied widely. One had experience caring for children and was seeking employment as a nanny. Another young woman was enrolled in beauty school and wanted to pursue a career in cosmetics. The personalized attention these sessions provided ensured that no matter what path each woman wanted to take, she got valuable advice. Each woman walked away from the class with not only a wealth of new knowledge about getting hired, but also a gift employment prep kit to help with their job search. The volunteers generously provided each woman who completed the class with a job searching book, a portfolio for resumes, thank you cards and stamps for interview follow-up, and even a metro card and breath mints for interview day! Thank you to our amazing group of volunteers from MGAC for leading this set of Life Skills classes!